Monsters have long stalked us in the darkness. Within this book, you’ll find a host of these creatures for use in the Pathfinder Roleplaying Game. Face off against archdevils and the Horsemen of the Apocalypse, planar dragons and the legendary wild hunt, proteans and psychopomps, and hundreds more! Some creatures, such as the capricious taniwha, the mysterious green man, or the powerful empyreal lords, might even be willing to provide your heroes aid—if they deserve it! 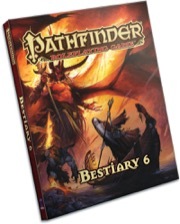 Pathfinder RPG Bestiary 6 is the sixth must-have volume of monsters for use with the Pathfinder Roleplaying Game and serves as a companion to the Pathfinder RPG Core Rulebook and Pathfinder RPG Bestiary. This imaginative tabletop game builds upon more than 10 years of system development and an open playtest featuring more than 50,000 gamers to create a cutting-edge RPG experience that brings the all-time best-selling set of fantasy rules into a new era. More than 200 different monsters. New player-friendly races, like the crazed monkey goblins, the telepathic albino munavris, the river-dwelling fey naiads, the wolflike rougarou, and the yaddithians of the Elder Mythos. Numerous powerful demigods, from archdevils and Great Old Ones to empyreal lords and qlippoth lords. New animal companions and other allies, such as fierce devil monkeys and loyal clockwork hounds. New templates, including the entothrope and the mongrel giant, to help you get more life out of classic monsters. Challenges for every adventure and every level of play. While there are some gems here, the Bestiary 6 is example #1 of the perils of pure money-grabbing. The number of downright silly or derivative creatures here is mind-boggling. Do we need more (X)-giants? Or more female sin demons? Speaking of gender, Paizo's blatant gender discrimination against males is on full display here, with far more creatures that are female-only or described as "A woman..." than there are for males. If you take all the gems from bestiaries 3-6 and get rid of all the silly or repetitive creatures, you'd have 4 bestiaries total, instead of 6. Instead, Paizo treats these like cable subscriptions, filling these books with numerous "channels" you don't want or need, while giving you a few you'll actually watch. And i thought i didn't need this one! I had thought when Bestiary 6 came out I wouldn't need it. This book will definitely take it's place as one of the essential Pathfinder books in my collection, if you're waiting to get this, don't! Get it now! My one complaint is mine had the same s#*&ty yellow binding glue as the first printing of the Starfinder CRB, but I'm not dropping the rating because it is that good (also I still have binding glue leftover from my Starfinder CRB). 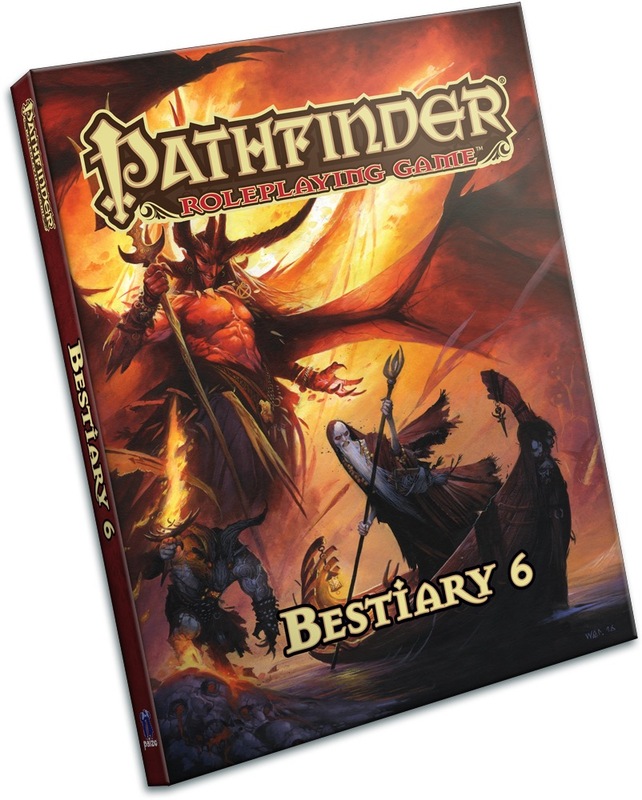 So Bestiary 5 was a bit disappointing to me, but this one is something that did something with Pathfinder I haven't seen in a while: gave me ideas that I wanted to use. A lot of the monsters presented are honestly interesting. As usual, there are some reprints from other products, but I always favor having consolidated lists of things. I won't use everything, but there is enough here that I'll be using a good chunk. Also, the weremantis reminded me how much I love Portal, so I have to give it to them there. A wide variety of creatures with overall high quality artwork. I like the inclusion of the numerous high CR creatures. Bestiary 5 and 6 have been my favorite Bestiary books by far. So me and two other guys from my gaming group ordered this book from amazon. WOW, all of us have missing and or scrambled pages. I have over 17 missing pages (most of the archdevils content)and more or less 20 pages out of order. I don't know if they are sending all the "special" books down here, but I can assure you I will never buy a physical book from Paizo anymore. I am super excited for this Bestiary more than any before it for one simple reason. One word even. KRAMPUS! I cant wait to see what Paizo comes up with for stats of this legendary creature. I hope they do some other holiday creatures. Samhain maybe. Also interested in a lovcraftian player race. March cant come fast enough. Announced for March! Cover and description are not final! You're trying to make sure I never sleep again, aren't you? Woo woo! Awesome to say the least! Arch-devils, horseman, and more emporal lords! I like the big ones! I won the initiative roll! Is this taking the place of the Encounter Codex? Oh, this comes a bit out of left field at this time. But bestiaries are always welcome! Is this "adjusting" the release schedule at all? Or is it just an add on to the Villain Codex + Encounter Codex + Starfinder for next year announced at PaizoCon? I'm excited for the Archdevils and Horsemen getting stats, but i would love to see more Demon Lords and Great Old Ones. Also i hope the Empyreal Lords have better stats than before. So the Monkey Goblin makes the transition from the Inner Sea Bestiary and the Munavri from Darklands Revisited from Golarion to Setting neutral. That is a fun character, isn't it? I hope he's a full green person not just a face in bushes. Bestiary 6 will be our Spring hardcover release, and is not an add-on. Usually there is only one spring hardcover, but next year, due to Starfinder, there will be no Pathfinder PRG hardcover release for GenCon, so this might be that. WOOHOO! More monsters are always good. By the way, will the other robots from Iron Gods be in this book? It would be nice to have them collected somewhere. Here's hoping for elemental lords and more aboleth variants. Never heard of the krampus. ??? This early? Not that I mind! Only 200 monsters? I hope there aren't many re-entries from AP's and inner sea bestiary then, more new monsters. The only monster from ISB I don't really mind having twice is the whirlmaw. I'm happy to see Krampus! Rougarou is nice too, but the other things I read there i'm not a fan of, but that also happend with Bestiary 5, and it turned out they saved the best monsters for last anyway. Can't wait for the cover of this. Wow, this sounds like an exciting edition to the Bestiary line. I love some of the ideas coming out of this. I'm particularly keen on the mention of "troops of goblins". I sincerely hope that this means we're going to get an actual troop template or statblock finally, with goblins being the example. I thought troops from "Rasputin Must Die!" (by the awesome Brandon Hodge) were truly inspired. I've been waiting for something like them, for personal homebrew and even freelancing, ever since. Agreed. I've been waiting for this for quite some time. It was my favourite encounter in 3.5, and I even made a campaign around it. Can't wait to do it against, but with it being in Pathfinder. The fact that this is back makes me super happy. This book will include the creatures from the Giantslayer, Hell's Rebels and Hell's Vengeance bestiaries converted to setting neutrality. Two headed dragons? don't we have enough of those multi-headed lizards already in Khala and Gorynych? The Wild Hunt! It seems this bestiary focusses more on unique creatures such as archdevils, wild hunt, baba yaga, the horsemen and krampus. But when does Santa Claus get stats? Excellent to hear -- are we getting the Encounter Codex then as well "early 2017"? That was announced at PaizoCon? And in Spring 2017, you'll have no problem pulling together an encounter on the fly with the Pathfinder RPG Encounter Codex, which will contain encounters from levels 1-20, with more details to come. Knew it was coming, and I swore I wouldn't, but...Wild Hunt and Charon? Ok, maaaybe just one more. And with this, Paizo has officially put out more Bestiaries than there were 3.x Monster Manuals (I'm counting Fiend Folio in that). Awesomeness. Santa Claus was stated a couple of years ago. Originally done for 3.5, Santa was converted to Pathfinder and is a 15th level arctic druid, but is only a CR 13 because his stats were all put into mental. I hope there is finally the Ravid and Digester, made new like most of the silly monsters from D&D that are left. I do hope we get picture-guessing monster vs monster competition again from Liz a month before the release, I really enjoyed that. I second this. That was both interesting and fun. Then reading the little ecology trivia notes that we got up until that point, and finally the big reveal with the monster's ecology. That was nice. So the Encounter Codex seems to be pushed back. I'll be here to do my regularly scheduled protean and psychopomp begging. Also The Wild Hunt. We've needed this. Though of course I would find out about this book like 20 minutes before I have to go to work. So wild hunt, canine 0HD race, dragons for the outer planes, playable water fey, green man, etc. interesting. I didn't even see the naiad PC race! Well, now that we have Mephistopheles...we can fight the REAL final boss of Hell's Rebels! oh no! this again!! im still using 3rd bestiary never used 4th one and im still about to buy 5th... damn!! WAIT. Rougarou as a playable race? I've read about some pretty horrifying legends about those things, lol. I'm going to assume that they're not going to have the racial ability "turn people who see them into more Rougarou". It's safe to assume that is not the final cover, correct? Will I ever catch up? Still -- YAY! I hope to see reprints of the oni and kami from the jade regent AP.